You spend a lot of time picking out the perfect college supplies for your dorm room decorations. You want your college dorm room to be unique, after all. You also want your college dorm room to be comfortable and feel like a home away from home. It may sound odd, but dorm lights are some of the dorm essentials that can help you have a unique dorm room decor all year round. Plus you'll be adding extra light to your college dorm room, which is essential! 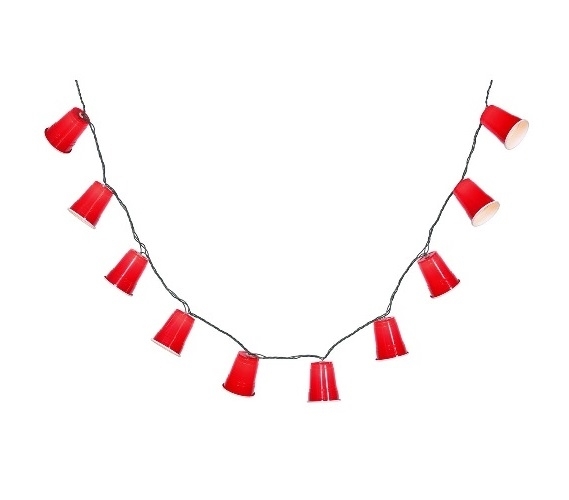 For unique dorm lights to add to your dorm room decor, add our 10 Light Red Party Cup Set to your college dorm checklist. Our 10 Light Red Party Cup Set has a one of a kind look that is a great addition to dorm room decor. Plus you'll be displaying your sense of humor by having this dorm essentials item in your college supplies. You can add these dorm necessities to your college Christmas tree for a truly unique look that no one else on your dorm floor would think of. You can even have these college supplies in your dorm room decorations throughout the whole college year. Make a design on your dorm wall with them or add them to your dorm desk or college bookcase for a cool looking dorm room decor. Featuring 10 red party cups on green wire, you can't go wrong by having this humorous dorm item in your college supplies.